If you are traveling by air, then Bagdogra is the only airport in the proximity although it is 195 kilometers from the destination. Alternatively, if you have taken the train, then disembark at Alipurduar station which is only 30 kilometers from Jayanti. You can hire taxis from Alipurduar station to reach Jayanti. Jayanti can also be approached from Cooch Behar and Jaldapara through Rajabhatkhawa. 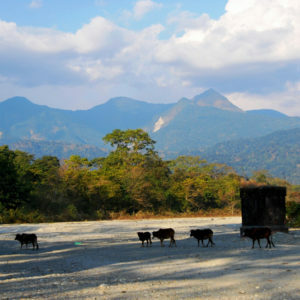 Jayanti can be visited any time of year because of its pleasant weather. However, it is advisable to avoid the monsoons. 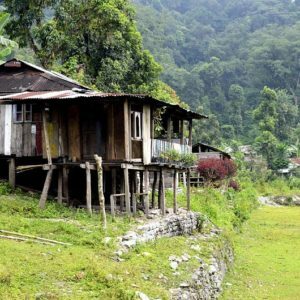 Accommodation facilities in Jayanti are basic. You will be able to enjoy your sojourn in the cottages with single and double bedrooms inside the forest area which is exciting. Attached bathrooms with hot water are available 24/7. 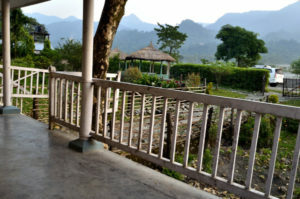 You can savor the lovely view of the Bhutan hills and the Jayanti River from the windows. The spectacular scenic beauty of the place will leave you asking for more. The owners of the homestays will arrange for guides and permits to explore the forest area and also visit the watchtower to spot animals. The food served is essentially Bengali cuisine and it is delicious. Apart from exploring the forest and spotting animals like tigers, leopards, peacocks, deer and elephants from the watchtower you can visit the other tourist attractions nearby. The ruins of Buxa Fort are a historical site located at an elevation of 2600 feet. It was built during the British reign in India and used to serve as a prison for the freedom fighters. 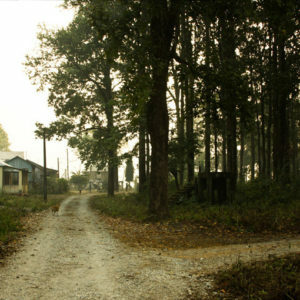 Later it became a refugee camp area for the Tibetans and Bangladeshis flees to India. There is a lake known as pokhri by the locals close to Pokhri Hill which is a sacred place for the local population. The fun part is that you have to trek to these spots. The Mahakal temple is a popular religious site for the Hindus located near Bhutan border. It is actually a cave dedicated to Lord Shiva and is also famous for bird watching. Also the Bala River bed is another spot for bird watching. Peacocks are easily spotted in this zone and taking a stroll along the bed will be gratifying. However, tourists are not allowed here at evening because of frequent visit from leopards. 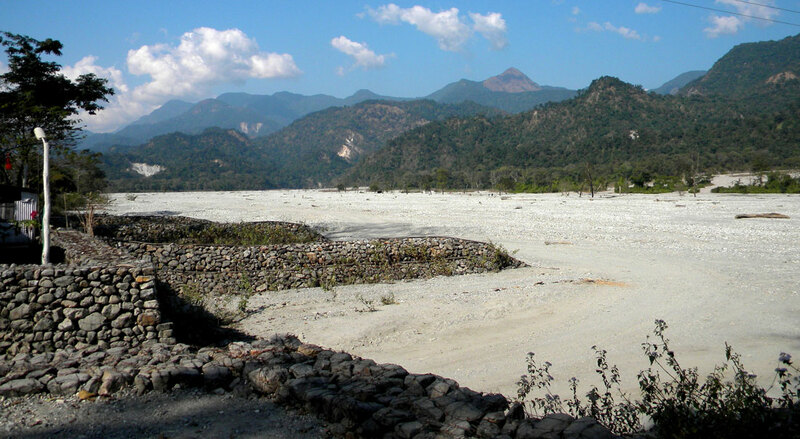 You can also visit the Bhutia Basti located 1.5 kilometers from Jayanti. Narthali Lake, Rajabhatkhawa and Santarbari are other tourist spots. This entry was posted by indispottravel in Bird Sanctuary in West Bengal, Dooars in West Bengal, Forest Bungalow in West Bengal, Jungle Safari in West Bengal, Picnic Spots in West Bengal, Weekend Destination around Kolkata, West Bengal, Wildlife in West Bengal and tagged Accommodation facilities in Jayanti, Accommodation in Jayanti, animals at Jayanti, Bala River bed, bird watching at Bala River bed, Buxa Fort elevation, Buxa Fort height, Buxa Fort near Jayanti, Cooch Behar near Jayanti, cottages at Jayanti, distance of Bhutia Basti from Jayanti, distance of Jayanti from Alipurduar rail station, distance of Jayanti from Bagdogra, dooars, dooars in west bengal, doors north bengal, dours tour, food served in Jayanti, fooding and lodging at Jayanti, Forest, homestay at Jayanti, hotels at Jayanti, how many types animals can be seen at Jayanti, how to go to Jayanti, how to reach Jayanti, Jaldapara near Jayanti, Jayanti, Jayanti attractions, Jayanti forest village, Jayanti is Located along the banks of Jayanti River, Jayanti location, Jayanti village inside the Buxa Tiger Reserve, jungle, Mahakal temple, Mahakal temple location, Narthali Lake at Jayanti, night stay at Jayanti, north Bengal, Peacocks at Jayanti, Pokhri Hill, pokhri lake, Queen of Dooars, Rajabhatkhawa at Jayanti, Rajabhatkhawa near Jayanti, reaching Jayanti, resorts at Jayanti, restriction to visit Jayanti at night, room availability at Jayanti, room facility at Jayanti, room rent at Jayanti, Santarbari at Jayanti, spot tigers in north Bengal forest, Staying in Buxa Tiger Reserve forest, Staying in the village within the Buxa Tiger Reserve, watchtower at Jayanti, when to go to Jayanti, where to stay at Jayanti.